In terms of revenue, the global controlled release fertilizer market is estimated to reach a valuation of US$3.92 bn by the end of 2024, increasing from its valuation of US$2.41 bn in 2015 at a CAGR of 5.6% during the forecast period of 2016–2024. By volume, the market is projected for a growth rate of 5.7% during the same forecast period. Controlled release fertilizers are part of enhanced efficiency fertilizers. These are granulated fertilizers that release nutrients gradually into the soil. Controlled release fertilizers are usually coated or encapsulated with inorganic or organic materials that regulate the rate, pattern, and duration of plant nutrient release. Common polymer materials used for coating are polysulfone (PSF), cellulose acetate (CA), and polyacrylonitrile (PAN). Most controlled release fertilizers are used in agriculture and horticulture applications. Controlled release fertilizers are employed in the cultivation of cereals & grains, oilseeds & pulses, and fruits & vegetables. Furthermore, they are used in the cultivation of turfs, lawns, and ornamental plants. Growth in the global population coupled with the shift toward sustainable agriculture is expected to drive the controlled release fertilizer market during the forecast period. 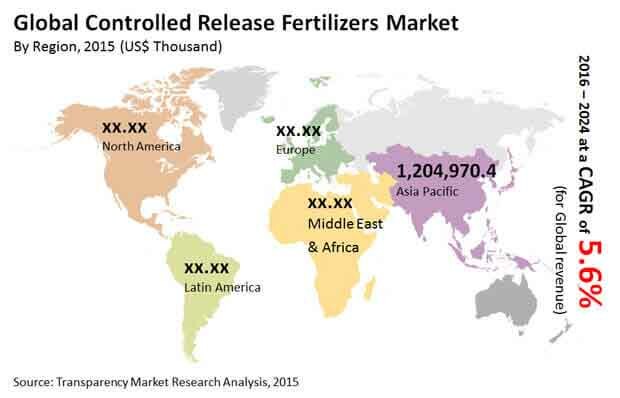 This study analyzes, estimates, and forecasts the global controlled release fertilizers market in terms of volume (tons) and revenue (US$ thousand) from 2015 to 2024. Market numbers given in the report describe the demand for global controlled release fertilizers, but not production or supply. The controlled release fertilizers report also analyzes several driving and restraining factors and their impact on the market during the forecast period. The report provides comprehensive analysis of the controlled release fertilizers by key products and applications. It segments the market into key products that include polymer sulfur coated urea/sulfur coated urea, polymer coated urea, polymer coated NPK fertilizer, and others (including coated micronutrients). It further segments the market into the following key applications: cereals & grains, oilseeds & pulses, fruits & vegetables, and others (turf, ornamental plants, etc.). The report also segments the market based on major geographies into North America, Europe, Asia Pacific, Latin America, and Middle East & Africa. It further provides volume and revenue for each application segment for each region. This includes 12 unique country-specific analysis. The report includes an overview of the market share of key companies in the global controlled release fertilizers market. Market share of companies has been derived on the basis of production by manufacturers of controlled release fertilizers. Key market players profiled in the study include ATS Group, Greenfeed Agro Sdn. Bhd., The Scotts Miracle-Gro Company, HIF TECH SDN. BHD, Compo GMBH & Co. KG, Agrium Inc, Ekompany, Shikefeng Chemical Industry, AgroBridge (Malaysia), Haifa Chemicals ltd, Agrium Inc, Central Glass Co Ltd, ICL Specialty Fertilizers, and The Chisso Corporation. Profiles of key participants comprise important parameters such as company overview, financial overview, business strategy, and recent developments.